The Google Books preview for Brenda Kaufmann’s Fall Math Activities: Standards-based Skill-builders With Season Themes has a coloring page filled with monsters and other Halloween symbols. The official websites for both Hershey’s and Ben & Jerry’s have both coloring pages and other fun Halloween activities for kids. Fans of Dora the Explorer will enjoy this Halloween-themed Dora coloring page. Disney’s Go.com has a “Monster Lab” coloring page in their “Family Fun” section. Kaboose.com has a special “Trick or Treat” Halloween coloring page. Do you like the image at the top of this page? It’s from RavensBlight.com’s coloring page section. 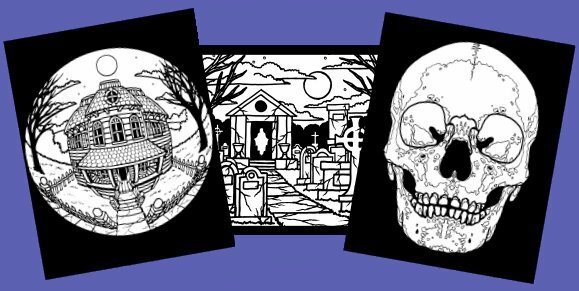 Speaking of which, the site also has some more advanced projects for those who are too old for coloring, such as an awesome skeleton and papercraft skull. Special thanks to Ray O’Bannon for the use of the image! Gravedigger’s Local 16 is not to be held responsible for the content on or anything that may occur (be it good or bad) as a result of visiting or downloading from any links on those sites. Attempt at your own discretion.